Are you ready to blast off to infinity and beyond? Not with those simple, civilian clothing, you’re not. You wouldn’t last a second in infinity and don’t even get us started on the beyond. If you want any hope of surviving after blasting off you’ll need to be at least dressed like the heroes that protect the galaxy from the likes of Emperor Zurg and other alien threats. Here, check out this Adult Buzz Lightyear Costume. This heroic outfit comes with a jumpsuit that has the typical uniform of a Space Ranger printed on it. It will even appear as if you have Buzz’s control panel on your arm. With the purple interlock hood and the polyfoam boot covers this transformation is literally from head-to-toe. Although what truly brings this classic Disney character to life is the set of foam wings that fastens to the back of the suit. With Velcro to secure the wings in place, you’ll be able to spring into action as fast as possible and never worry about losing this awesome accessory. 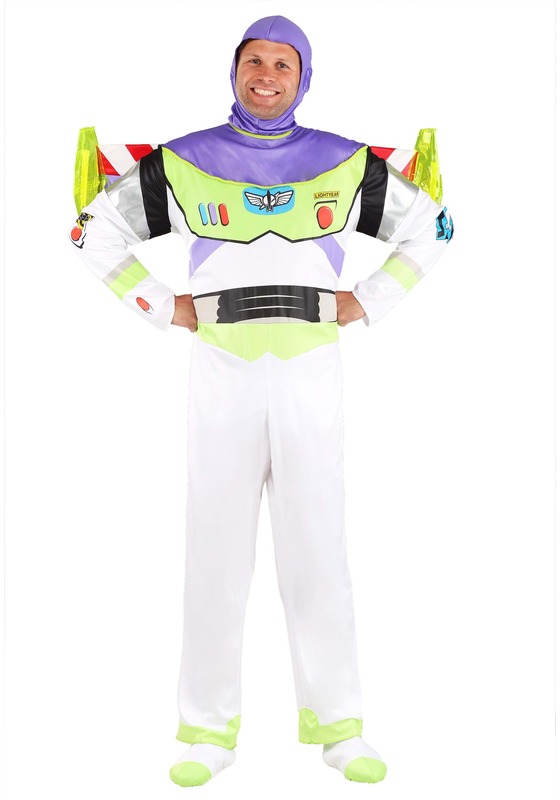 So, do you want this space-aged uniform for Halloween in order to have an awesome Toy Story-theme with your friends, or do you need it because you promised a certain youngster that his favorite hero would make an appearance at his next birthday party? Either way, with enough charisma you can easily breathe life into this beloved hero and put smiles on other’s faces. Just don’t expect to be able to go toe to toe with Zurg… you may look ready to dance with the galaxy’s evilest but you best just leave that to the real Buzz Lightyear. That guy is good at what he does, and that’s protecting the universe!